I really wasn't anticipating reading any of the Little House books again for a few more years. Certainly not outloud to my son. 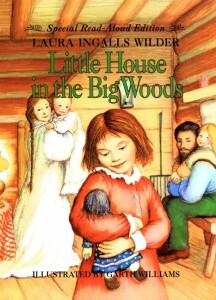 However, when Barbara announced that she would be hosting a Laura Ingalls Wilder Reading Challenge, I thought that the least we could do was give Little House in the Big Woods a try with Bookworm1 and see how it went. And it went! It went well! I never realized how perfectly suited (at least the first book is) to ages 5 and up. As Wilder tells the story of her growing up years in the Big Woods with Pa, Ma, Mary and Baby Carrie she explains in ways that young children can understand. You truly learn how they went about making cheese, threshing wheat and making hats. She brings sometimes complicated chores down to a level where children can visualize them. I loved that! I'm so very glad that we took the time to read this together. I won't rehash the storyline as you are likely familiar with it. Instead I'll just share Bookworm1's reaction to the various stories Laura shares in this book. "Why is this story so yucky!?" Moving on to Chapter Two "we" discovered that Laura and Mary were involved in helping with various household tasks, including the making of their own bed. "Why do they make their bed EVERY DAY?!" From there on out the general reaction to the book was, "WHY? WHY? WHY?" Why work so hard for cheese? Why spend days twisting straw to make hats? Why, most especially, do they have to sit quiet and still all through Sunday?! (This, as you might imagine, was mind blowing to the boy.) It opened up an interesting conversation between us though. I explained that they believed you should rest on the Sabbath and to them that meant playing quietly and being still all day long. "Mommy, do we believe that?!" I did get a little bored during the chapter about the Harvest and I skipped past Laura's descriptions of the women's dresses at the dance. However, on the whole this was a very fun story to read aloud and I'm grateful to Barbara for hosting this challenge to give us a good reason to launch into this fabulous story. 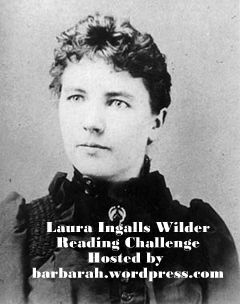 I'm linking this post up to Barbara's Laura Ingalls Wilder Reading Challenge and also to Amy's Read Aloud Thursday post over at Hope is the Word. Well, Baby Carrie, huh? My sister is named after a book character (title? ), but since I believe it to be a romance novel, I've never really investigated it. I love B1's reactions! :) A namesake!! Sounds like BW1 asks some good questions. M just listened to this in her bedroom...no discussion. :( but we have listened to it together before. This is one of the books I brought with me to the hospital, though I haven't started it yet. My mom read this series aloud to us each winter. I always liked the fact that my name was in these books! I never made the connection with Carrie Ingalls until you said that! I remember being grossed out by the pig's bladder, too. I don't think I would have ever played with one, but, I don't know -- with very little else to play with, I might have. I'm so glad you joined in! Tell me you at least left in, "Pull, Ruby, pull!" My mom read the whole series to us when we were fairly little, and I re-read them as an older kid or teen. My kids are hearing this one book at a time as well, and they like it. We read Farmer Boy a few months ago. I wanted to "test" the series with the book that's not about Mary and Laura and they were studying farms at preschool so it was appropriate. I grew up reading LIW, mostly because it was about a country girl! I could relate to many of the things in the books, not quite the hardship of living but just having chores and living near wild places. I'm going to wait a bit longer, until Z is ready to read them with us! I'm so glad you were into Nancy Drew. I loved (and still do kinda..) Nancy Drew, and I don't know WHY. So formulaic and she's completely unbelievable. I still like her though. And I totally knew that's where you got your name! :) Off topic: I was named for a family friend. Probably just as well -- my mom had previously wanted to name me Consuelo. Also somewhat off-topic, Nancy Drew was my hero when I was younger. @Annette - I think I'm getting closer to listening to an ebook. Bookworm1 keeps asking to listen to Paddington in the car so we do because I have that on a cassette and he seems to like it. I'm wondering if we should start trying some others. @Carrie - ;D We have another family name in this book, a fact which my oldest found rather hilarious. @Barbara - I think if I didn't have many things to play with AND I thought playing with a pig bladder was normal, then I would. Otherwise I'd be a very. hard. sell. @Diary of an A - Yes, I did read that. And that was about where I stopped because I realized a.) this was not going to make a lick of sense to him and b.) I was kinda bored with the descriptions of the dresses myself. @Taia- Good to know and be aware of. I don't think we'll be moving on in the Little House series any time SOON. I was thinking we'd try Little House on the Prairie next year when the LIW challenge rolls around again. @Sky - I'm totally looking forward to reading these with Baby Girl at some point. @Canaid - I'm laughing at the idea of your mom wanting to name you Consuelo.